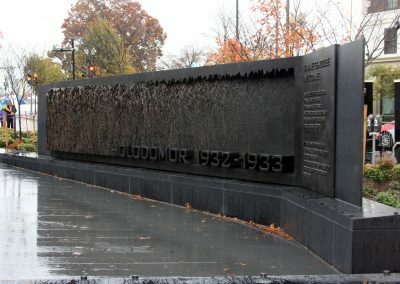 The focal point of the Holodomor Memorial in the capital of the United States of America is a monumental bas-relief bronze sculpture entitled “Field of Wheat”. 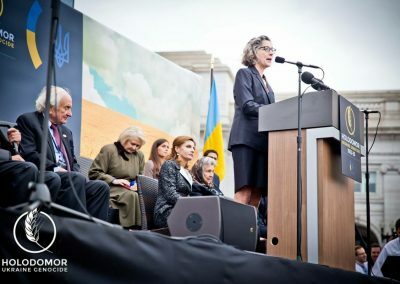 Wheat was selected as a theme not only because its confiscation lead to so many millions of innocent deaths but also because wheat is one of the few associations, if any, that Americans make with Ukraine. The depiction of wheat is not static. Across 30 feet, highly articulated wheat heads and stalks eventually fade away and recede deeply into the background, thereby expressing the transition from harvest bounty to famine deficit. 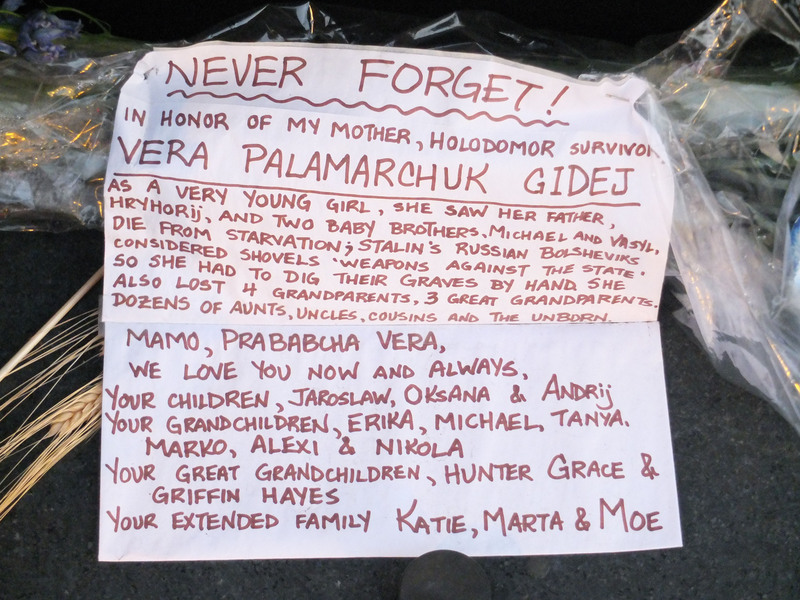 Simultaneously with the disappearance of wheat, the phrase “HOLODOMOR 1932 – 1933” steadily emerges. 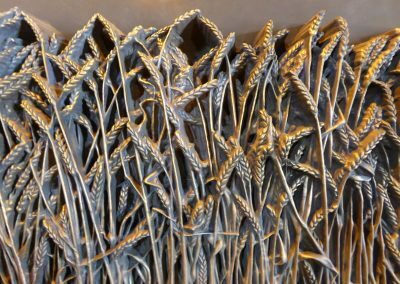 The haunting negative space of the sculpture is intended to convey the willfulness and irony of the famine, forcing viewers to fathom the inhumanity of using wheat as a political weapon in what was once the “Breadbasket of Europe”. 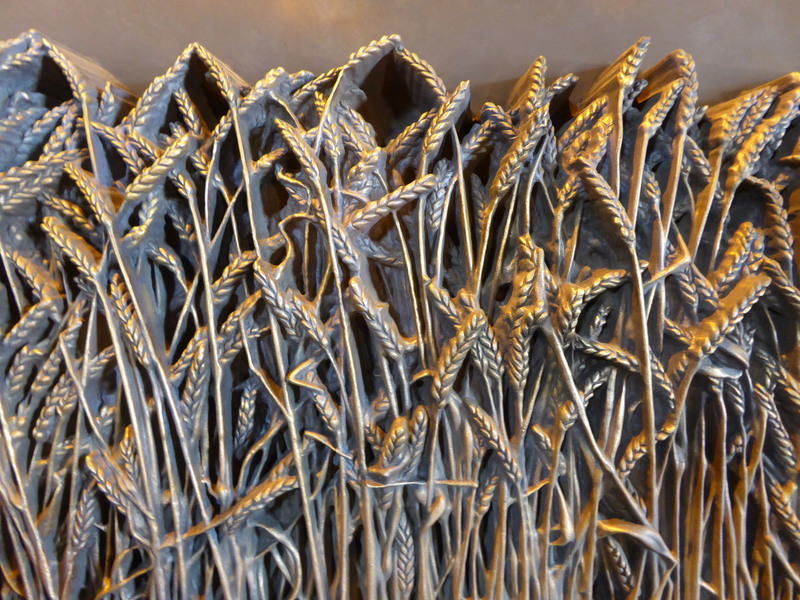 The “Field of Wheat” sculpture is placed within arms reach. 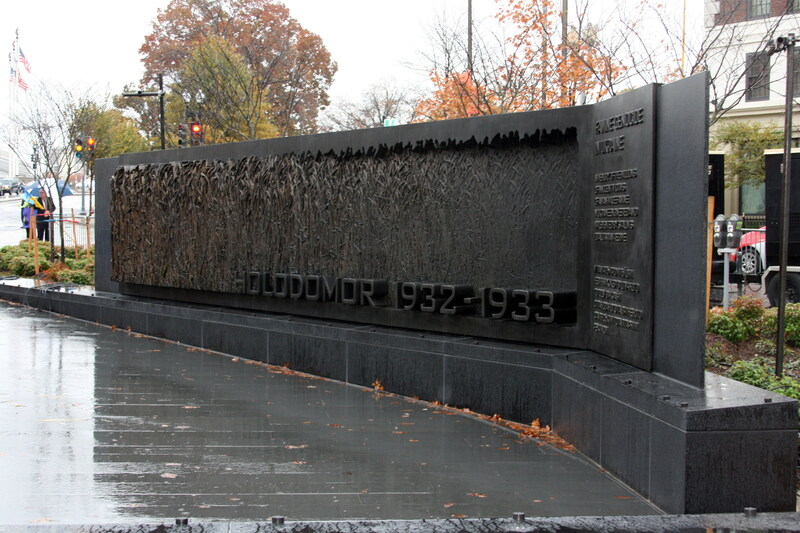 This encourages a more personal connection to the memorial through touching and burnishing of the bronze surfaces. It is elevated on a granite wall which grows in height as the site slopes down to the west. 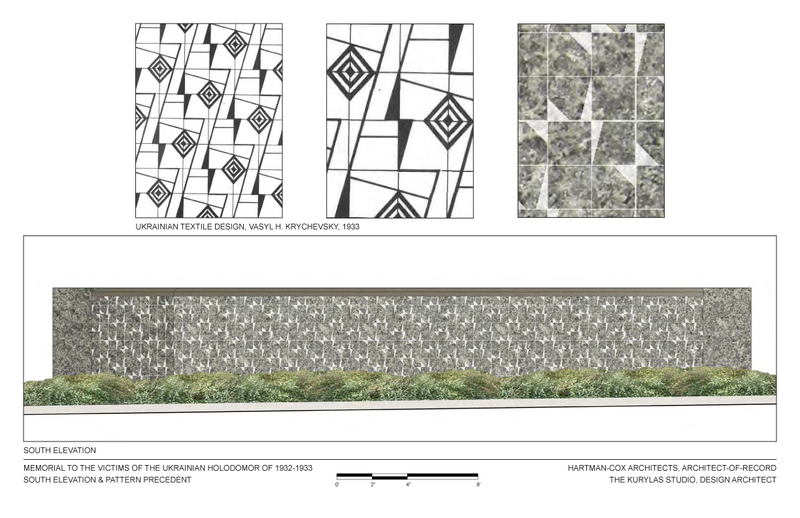 The configuration of the wall responds to the triangular geometry of the site, alternately following the diagonal angle of Massachusetts Avenue and the grid of F Street. A bench integrated into the western end of the wall allows for contemplation of the “Field of Wheat” sculpture against the background of DC landmarks such as the Post Office Museum and Union Station. 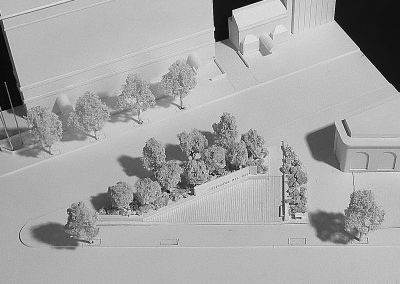 As befits the site, the “Field of Wheat” sculpture is primarily oriented to the more important street — Massachusetts Avenue. 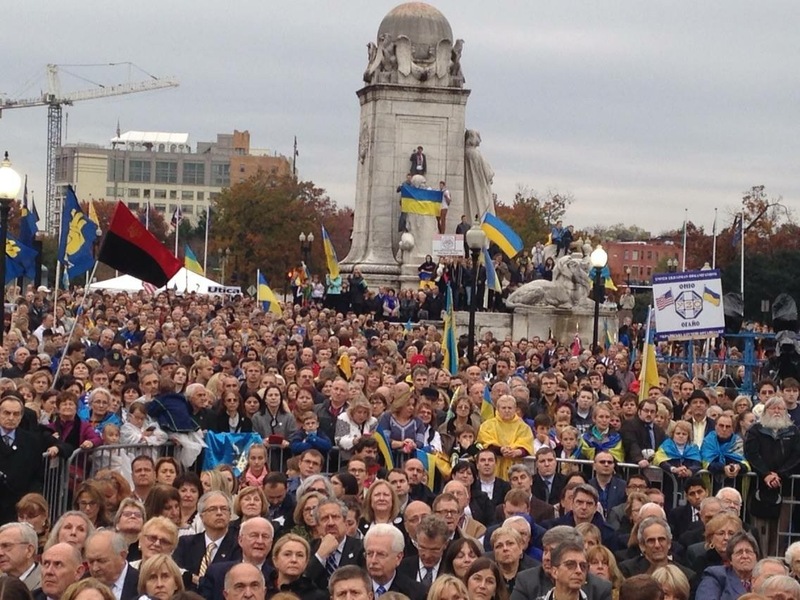 It is placed closer to the western end, where the triangular site is widest, not only to distance it from the very busy intersection of North Capitol Street, Massachusetts Avenue and F Street, but to allow for larger commemorative gatherings. 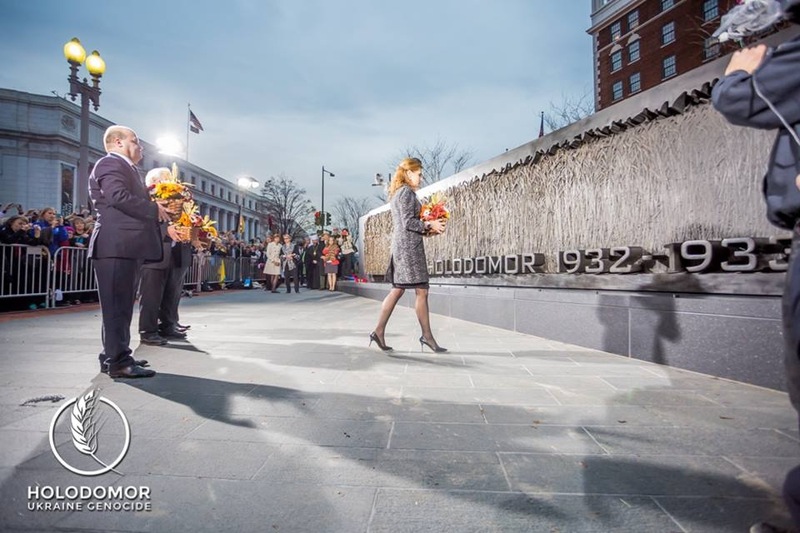 The memorial plaza is paved in furrowed slate having a linear texture evocative of barren plowed fields. 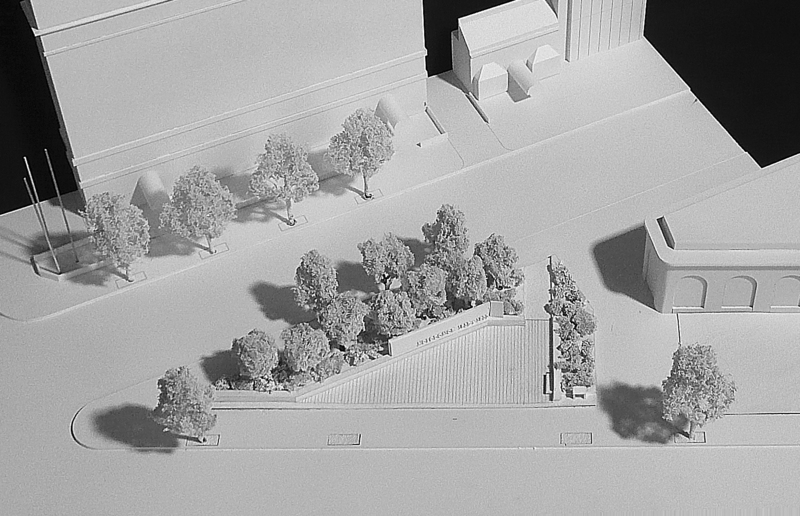 Here, the sculpture does not interrupt the site lines of Massachusetts Avenue, intentionally imparting a lower profile and restrained character to the memorial. 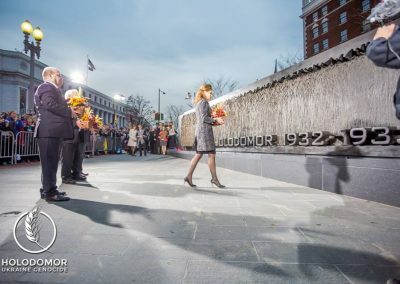 A wide brick sidewalk connects the memorial plaza to F Street where a wall of granite panels, attached to the back of the bronze sculpture, mediates between the Holodomor Memorial and sidewalk cafes across the street. 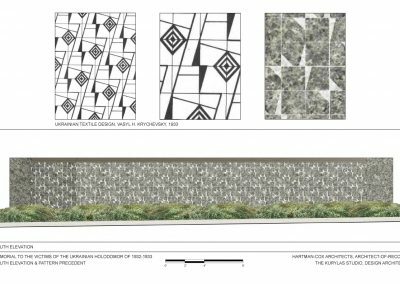 The panels are etched in a geometric pattern derived from a folk-inspired design by Vasyl Krychevsky in 1933. 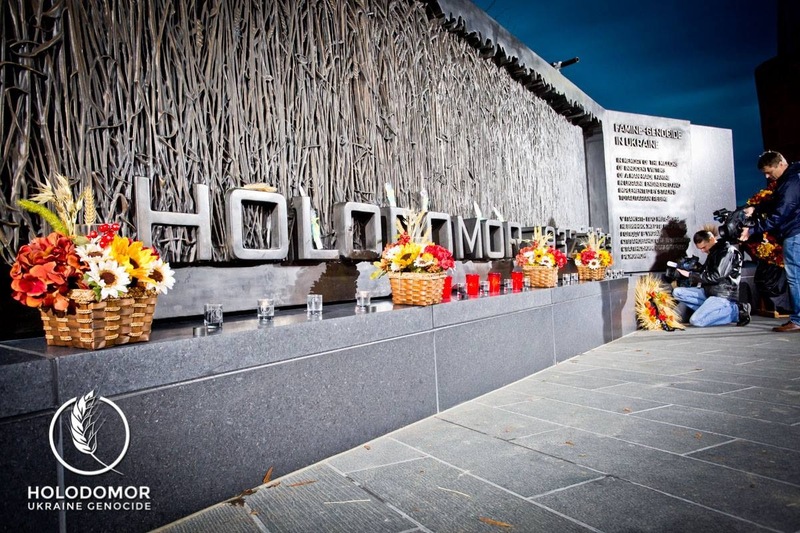 Use of the design bespeaks of the attack on Ukrainian culture – a parallel goal of the Holodomor. 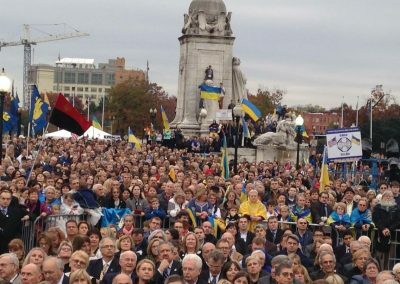 The pattern was also selected for its vaguely barbed character, alluding to the Ukrainian border which was deliberately sealed by the government at the peak of the Holodomor. Staggered native purple–leafed Redbud trees create a distinctive and somber backdrop for the “Field of Wheat” sculpture, in contrast to the surrounding street trees and drawing attention to the memorial from far away. Two types of native Nandina Domestica shrubs, selected for hardiness and year-round interest, are interspersed among the trees and occupy the rain garden, designed to capture all storm water runoff at the western edge of the site. 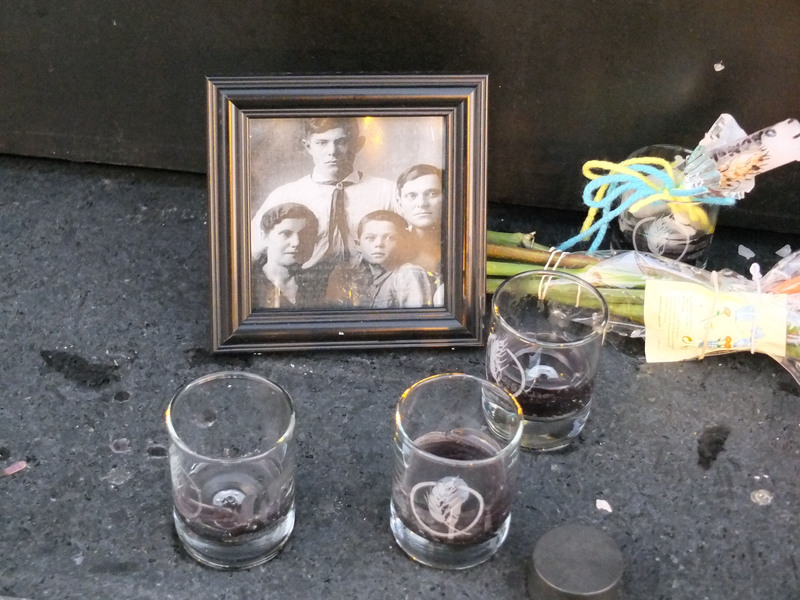 The shrubs have white flowers and develop red berries reminiscent of “kalyna” — so prominent in Ukrainian folklore. 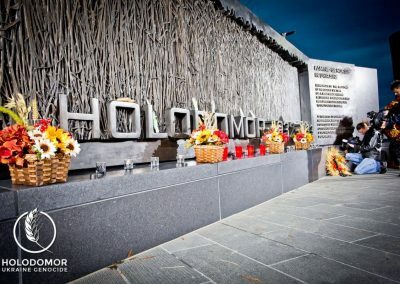 In the positive-to-negative treatment of the “Field of Wheat” sculpture, in the arrangement of elements on the site and in the basic horizontality of the whole, the intent was to create a subtle yet powerful memorial befitting the memory of the millions of victims who perished in the Holodomor. The memorial site is equally designed to allow for contemplation by a single person, a few individuals, or an entire group of people. 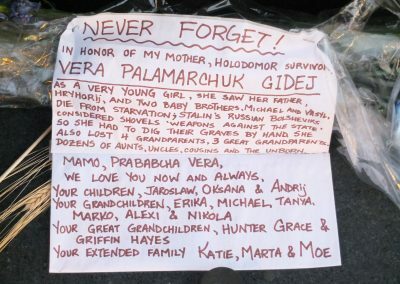 A nighttime image comes to mind: hundreds of candles flickering on the wall and a gathering of people solemnly singing “Vichnaya Pamyat” — “Eternal Memory”.